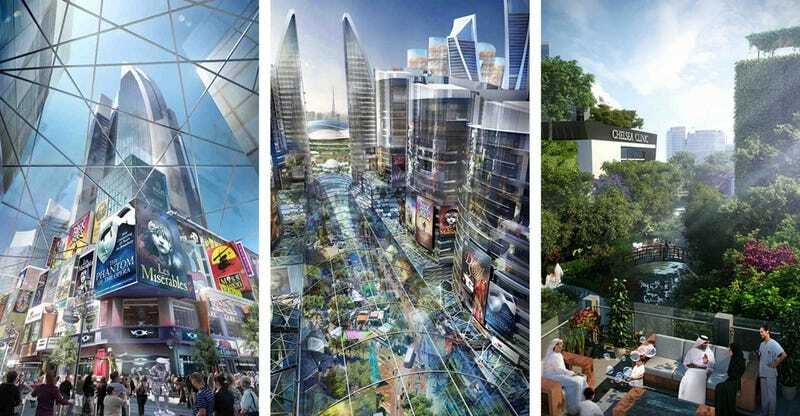 Dubai has unveiled plans for the world's first indoor, climate-controlled neighborhood—a 450-hectare city area with a retractable glass roof and the world's largest shopping center. This sounds to me like the hell on earth but I better get used to it: Every major city will probably be like this by the end of the century. It will be called Mall of the World and will have over one hundred hotels and serviced apartment buildings. It will include a 750,000-square-metre shopping center, a theatre district modeled on London's West End and New York's Broadway, and a "celebration district" designed in the style of La Rambla in Barcelona. The entire thing may seem preposterous for some, but this is where we are headed. It will happen in major cities too. The convenience of climate control is too strong to ignore. The population will love it, the tourists will love it, and, perhaps more important for its development, the corporations will love it. Imagine that: A place like SoHo in New York—which is already a giant playground and mall—completely isolated from weather, with the right temperature, no rain, no snow, no heat. A perfect place to live and consume.